What do you mean by the equation of a Straight Line? 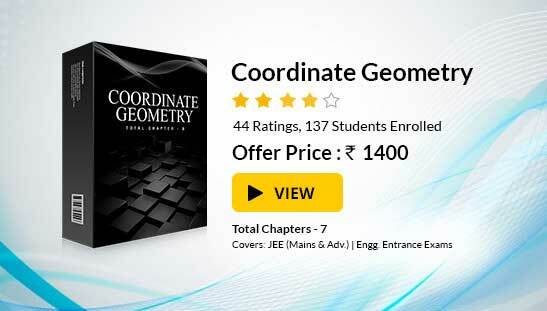 Straight line is an extremely important and a vast topic of the mathematics syllabus of IIT JEE. Students are advised to go into the intricacies of topics in order to master them. In this section, we shall discuss the equation of straight line in various forms and illustrate the concepts along with certain examples as well. Aspirants must try to grasp these concepts in order to excel in competitions like the IIT JEE. A certain kind of relation between the variables x and y which is met by the coordinates of every point lying on a line is termed as the equation of a straight line. Any linear equation in two variables x and y always represents a straight line. Equation of a line which is parallel to x-axis or perpendicular to y-axis at a distance ‘c’ from it is given as y = c.
Equation of a line which is parallel to y-axis or perpendicular to x-axis at a distance ‘c’ from it is given as x = c.
The most general equation of a straight line is ax + by + c = 0, where a, b and c are any real numbers such that both a and b can’t be zero simultaneously. 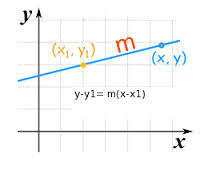 If we have a straight line whose slope is ‘m’ and which makes an intercept ‘c’ on the y-axis then its equation is given by y = mx + c.
As shown in the figure above, the y-intercept here is c.
The equation of a straight line having slope as ‘m’ and which passes through the point (x1, y1) is given by (y-y1) = m(x-x1). This is parametric form of the equation of a straight line. 1. Note that ‘r’ is positive if the point (x, y) lies on the right of (x1, y1) and negative if the point (x, y) lies on the left of (x1, y1). (y-y1) = m(x-x1) or (y-y1) = (y2-y1)/(x2-x1). (x-x1). 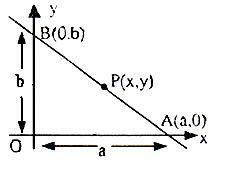 If we are given the intercepts of a line on the x and y axis respectively as ‘a’ and ‘b’ then the equation of the straight line is given by x/a + y/b = 1. ⇒ y/b = –x/a + 1. ⇒ x/a + y/b = 1. 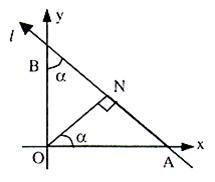 This is intercept from of the equation of a straight line. x cos α + y sin α = a is the equation of the straight line in perpendicular form, where ‘p’ is the length of the perpendicular from the origin O on the line and this perpendicular makes an angle α with the positive direction of x-axis. This is the equation of a straight line in normal form, where p is perpendicular distance of the line from origin. P is always measured away from the origin and is always positive in value, αa is a positive angle less than 360o measured from the positive direction OX of the x-axis to the normal from the origin to the line. Intercept form: This form is given as x/(-c/a) + y/(-c/b) = 1, here x-intercept is (-c/a) and y-intercept is (-c/b). cos α = -a/√(a2 + b2), sin α = -b/√(a2 + b2) and p = c/√(a2 + b2). The ends of a rod of length l move on two mutually perpendicular lines. 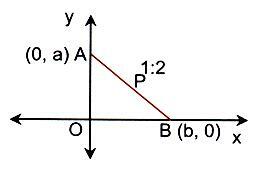 Find the locus of the point on the rod, which divides it in the ratio 2 : 1. 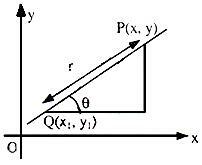 Suppose the two perpendicular lines are x = 0 and y = 0 and let the end of the rod lie at the point (0, a) and (b, 0). ⇒ a = 3k/2, b = 3h. Also l2 = a2 + b2. ⇒ l2 = (3k/2)2 + (3h)2.
x2 + y2/4 = l2/9, which represents an ellipse. Similarly, take the ratio AP : BP as 2 : 1 and proceed. We get the result as y2 + x2/4 = l2/9. Find the locus of the point of intersection of the lines x cos α + y sin α = a and x sin α – y cos α = b. where α is a variable. Let P(h, k) be the point of intersection of the given lines. Here a is a variable. So we have to eliminate a. ⇒ h2 + k2 = a2 + b2. Hence locus of (h, k) is x2 + y2 = a2 + b2.